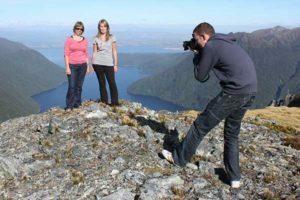 Filming and photographic opportunities abound in the spectacular scenery throughout Fiordland. The experience and knowledge that our pilots have of this region is invaluable when it comes to selecting the best aspects and landing locations, and we love to take you to places that encapsulate the real Fiordland. Save yourself time and money by drawing on our expertise – we can tailor trips and itineraries to suit your requirements. See “Ata Whenua” at the Fiordland Cinema or view the trailer here to get a taste of the experience and the locations we can fly you to. We’ve flown some of the most talented filmmakers and photographers in the world to its most breathtaking places, helping them capture the shots they’ve dreamed of in the perfect light.